They say misery loves company. Well, happiness loves company too. The mood of the people you surround yourself with might rub off on you. Lately my friends have been depressed and it’s been effecting my mood. I feel bad they are facing hardship and the conversation isn’t pleasant, which can be a downer. Whenever I’m feeling down, being around a group of cheerful people helps me feel good. A good laugh is a great remedy for the blues. Everyone loves company. Just want to let you know … I LOVE your doodles!!! 🙂 Thank you for sharing them! True! Laughter is good medicine. It really is 🙂 I’ve had some down days lately and went to see some friends of mine. They told some funny life stories and we laughed and laughed and it really picked my mood up. Nice! That’s what I need right about now, a good laugh. I think I’ll watch a good funny movie with the fam tonight. You truly invigorate me at a time when I really need it. Thank you. You have a loyal follower and friend in me…I truly hope. Twitter/KatGWriter , katgrantfreelance.com, unmistakablykat.WordPr e ss.com, facebook.com/Kat.grant.freelance, http://www.about.me/Kat_grant visit often. Let’s chat. Did I accidentally click comment on the wrong post? Well, I loved them both. I really like this one, Company, because it’s such a unique concept. It shouldn’t be, but it is. 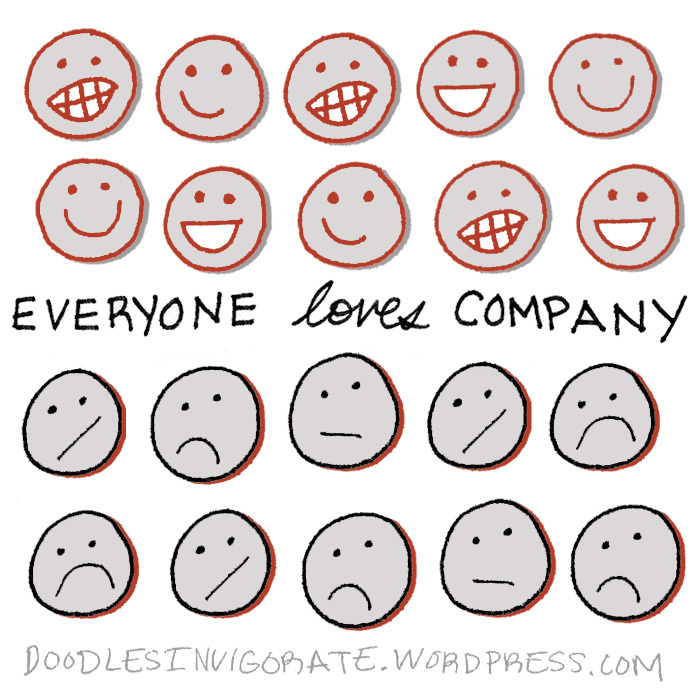 I don’t think I’ve ever heard anyone say “Happiness loves company, too”. You are so right. I will continue to follow you as well. I didn’t realize you posted on the wrong post. 🙂 Thank you!